Arundhati Bhattacharya is a perfect role model. Her success story will inspire many women to take up banking as a career in the years ahead and even vie for the top jobs. When Arundhati Bhattacharya was posted as General Manager (GM) in Lucknow in 2006, she actually thought of leaving State Bank of India (SBI), the country's largest bank. "My worry was finding a proper school for my child," says Bhattacharya, the first woman chairperson of the 208-year-old public sector bank. The decision to move to a new city was tough as she had spent most of her life in Kolkata. It was then that her former boss and mentor M.S. Verma intervened and prevented Bhattacharya from putting in her papers. "Having come so far in your career, there is no question of giving up at this juncture. Things will sort themselves out," Verma, who was the Chief General Manager and her boss in the mid '90s, counselled her. Verma had also become the chairman of SBI in 1997. Bhattacharya heeded her mentor's advice and it turned out to be the right decision - she has had a meteoric rise to the top since then. In the last four years, in particular, she has been given a slew of promotions. She became the deputy managing director in November 2010. Two years later, she was posted as MD & CEO of SBI Capital Markets, a subsidiary of the bank. She became the CFO & MD of the bank in August 2013. Two months later, she superseded three male colleagues to reach the corner room as the first woman chairperson. "When you actually tread that (difficult) path, things get resolved themselves," says Bhattacharya. "Nothing is as bad as it seems to be. If you take the plunge, you will somehow manage to swim across." The journey of Bhattacharya, 58, has been full of challenges. Her formative years were spent in east India. Bhattacharya's father was an engineer at Bhilai Steel Plant, West Bengal. She finished her schooling at St Xavier's School in Bokaro Steel City where teachers spotted her flair for English literature and encouraged her to pursue further studies in the subject. "The father at my school felt that the creative field will be right for me," remembers Bhattacharya. She heeded the advice of her teachers and took English literature as a subject during her graduation at Kolkata's Lady Brabourne College and postgraduation at Jadavpur University. 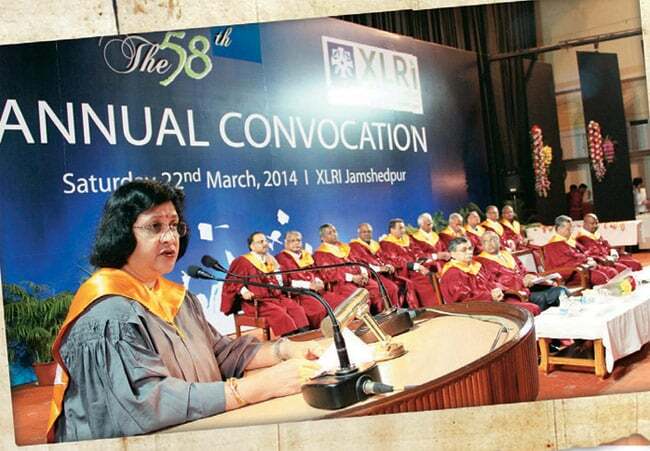 Mentor and guide: Arundhati Bhattacharya at the 58th Annual Convocation of XLRI Jamshedpur in March this year. Banking was not on her horizon at the time. "It sort of just happened," grins Bhattacharya. She heard about the probationary officer examination while staying in the Jadavpur University hostel. "Those days, SBI was one of the best paymasters," says Bhattacharya, who appeared for the examination along with her other hostel friends. She went through the process of learning the basics of banking after she joined in 1977. "That is done by the Institute of Bankers for all officers," she explains. Bhattacharya has been posted in all corners of the country - north, south, east and west. She also had a stint at SBI's New York office, overseeing branch performance and audit. Bhattacharya says each job that came her way was challenging. "Retail is very different from corporate," she says, who has honed her skills in foreign exchange, treasury, retail and corporate operations. Bhattacharya has done Human Resources towards the fag end of her career and has also been an investment banker. But the turning point, according to her, came when she got involved with setting up new businesses for the bank. She was actively involved in establishing joint ventures for the bank, including the tie-up with Insurance Australia Group for general insurance, Macquarie for private equity and Societe Generale for custodial services. Looking back, she finds her one-year assignment with SBI Capital as MD and CEO very challenging and satisfying. "At SBI Cap, I learnt to look at the bank from outside. It did make a big difference in my career," says Bhattacharya. "Unlike SBI, you have to fend for yourself at the subsidiary. You have to earn profits to pay the salaries," she says. Bhattacharya likes interacting with people. "I'm busy learning and meeting new people at my job and never get bored," she says. As the first woman chairperson of the bank, she also wants to meet the expectations of women employees who constitute 20 per cent of SBI's workforce. Bhattacharya has already taken a lot of initiatives for them, including a two-year sabbatical to pursue higher education, a transfer policy which allows them to be close to their family, and special training programmes to enrich their professional lives. "I'm also considering some kind of flexi timing and temporary deputation for women who are planning to start a family and want to be with their parents or in-laws." She wonders why there are few women in the public sector banks. "I don't find that many women now in the GM and DGM (Deputy General Manager) category in PSU banks," she says. However, SBI has a healthy pipeline of women managers. "We have 12 women in the CGM and upwards category," says Bhattacharya. Piyush Singh, MD of Accenture's Financial Services says Bhattacharya wanted to remove the perception that public sector banks are laggards, particularly in technology. He has worked very closely with Bhattacharya and her team on launching SBI's 'digital branches'. "I do not believe anybody (private banks) has taken a lead in the digital banking space like SBI," he says. But Bhattacharya will have to ensure that SBI scales up its digital banking initiatives fast to remain ahead of the competition. Clearly, Bhattacharya is a perfect role model. Her success story will inspire many women to take up banking as a career in the years ahead and even vie for the top jobs.